Use this page to add multiple items to your cart all at one time. For each style, you can enter a quantity by color/size that you want to add to your Cart and then click on the Add to Cart button at the bottom of the page. Our COVENANT fragrance is the same exact scent as our beautiful, heavenly "Ketubah" fragrance. We have changed the name to COVENANT OIL as it more aptly speaks of the commitment and devotion of the parties entering into a Covenant Relationship, both in the Marriage Covenant and in the believer's Covenant with the All Mighty One. It is a delicate blend of 4 fragrances that represent the three participants of the Marriage Covenant: Bridegroom...Frankincense & Myrrh; Bride...Spikenard; and the Holy Spirit...Hyssop. Our COVENANT fragrance is the same exact scent as our beautiful, heavenly "Ketubah" fragrance. We have changed the name to COVENANT OIL as it more aptly speaks of the commitment and devotion of the parties entering into a Covenant Relationship, both in the Marriage Covenant and in the believer's Covenant with the All Mighty One. 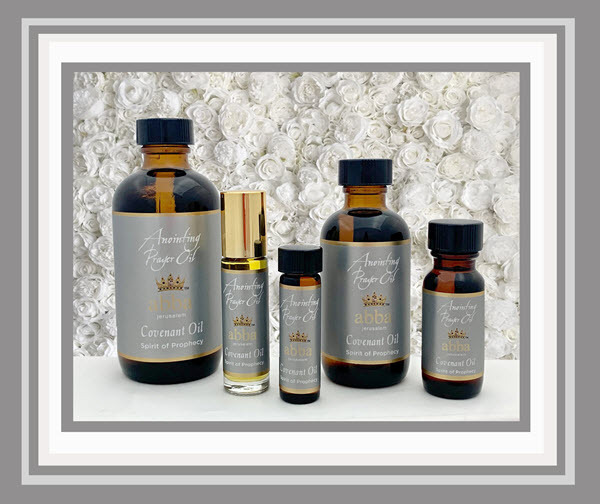 Abba's Ketubah anointing oil is a unique blend of pure olive oil from Israel with an essential oil base blend of Frankincense & Myrrh, Spikenard, & Hyssop. We have made available for purchase our 8 oz of Frankincense & Myrrh, Hyssop and Spikenard in a plastic amber container, which may be poured into any one of our beautiful oil holders. Abba's anointing oil is a unique blend of pure olive oil from Israel with an essential oil base. Our custom designed gold box with view window contains a 1/4 oz. bottle of each of our 12 fragrances: Cassia, Cedars of Lebanon, Cinnamon, Covenant, 2- Frankincense & Myrrh, Hyssop, King's Garments, Myrrh, Pomegranate, Rose of Sharon and Spikenard. If purchased separately these 12 anointing oils would cost $84.00. 1/3 oz. Roll-On bottle of each of our 10 fragrances: Cassia, Cedars of Lebanon, Covenant, Frankincense & Myrrh, Hyssop, King's Garments, Myrrh, Pomegranate, Rose of Sharon and Spikenard. If purchased separately these 10 anointing oils would cost $110.00.